Besiktas JK Istanbul finished the Turkish Airlines Euroleague regular season in style by topping Lietuvos Rytas Vilnius 66-65 in Group D on Thursday. Besiktas finished third in Group D with a 5-5 record. Rytas dropped to 2-8 and lost the chance to reach the Top 16. Daniel Ewing paced the winners with 14 points in his first game with the club. Serhat Cetin added 12 while Patrick Christopher, Curtis Jerrells and Gasper Vidmar scored 10 apiece for Besiktas. 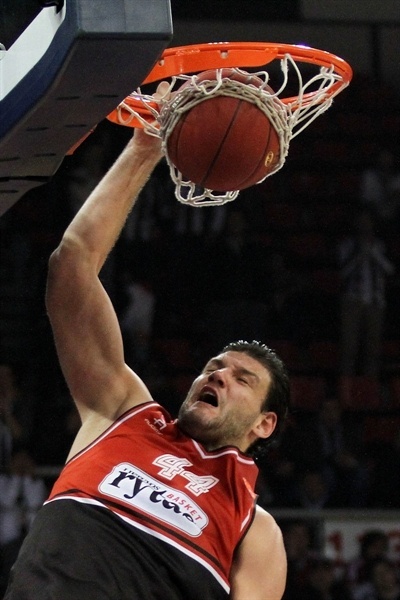 Dejan Ivanov led Rytas with 16 points. Leon Radosevic added 11 and 10 rebounds for the guests, who led 15-19 after 10 minutes. Ivanov starred as Rytas remained ahead, 33-39, at halftime. Christopher and Jerrells stepped up after the break, but the guests kept a 51-54 lead after 30 minutes. The fourth quarter saw as many as five lead changes. Rytas led 61-64 with three minutes to go and got its last lead, 64-65, on a free throw by Radosevic. Jerrells came through with the go-ahead put-back layup, but Rytas had a final chance to win the game with 12 seconds left. Janis Blums drove to the basket but the ball danced around the rim and did not fall in. Mindaugas Katelynas got Rytas going with a three-pointer and Nemanja Nedovic copied him right after that for a 0-6 lead. Damir Markota stepped up with free throws, which Radosevic erased with a close basket. Katelynas kept pacing Rytas with a big basket in the low post, but Jerrells shined with a coast-to-coast basket. Besiktas toughened up on defense, but kept struggling to score at the other end. Both teams went scoreless for more than two minutes until Vidmar stepped up with a two-handed slam. Rytas could not find the way to the basket and Jerrells scored in penetration to get within 8-10. Ivanov scored down low and matched Cetin's three-pointer with a layup-plus-foul to give the guests fresh air at 11-15. Cetin hit 2-of-4 free throws, but Radosevic shined with a layup in transition for a 13-17 score. Cetin stayed on fire with a running layup, which Radosevic matched with a tip-in for a 15-19 Rytas lead after 10 minutes. Both teams struggled to score early in the second quarter until Cetin took over with a fast break layup. Steponas Babrauskas bettered him with a three-pointer, but Randal Falker ignited the crowd with an off-balance basket to make it 19-22. Ivanov took over with a fast break slam, as Rytas started to use long possessions to find open shots. Ronnie Seibutis finished one of those with a wide open three-pointer for a 19-27 lead. A layup by Ivanov made it a double-digit game as Besiktas called timeout. Fikret Can Akin nailed a long jumper, but Predrag Samardziski took over with a put-back basket. Besiktas found a go-to guy in Vidmar, who shined with consecutive layups. 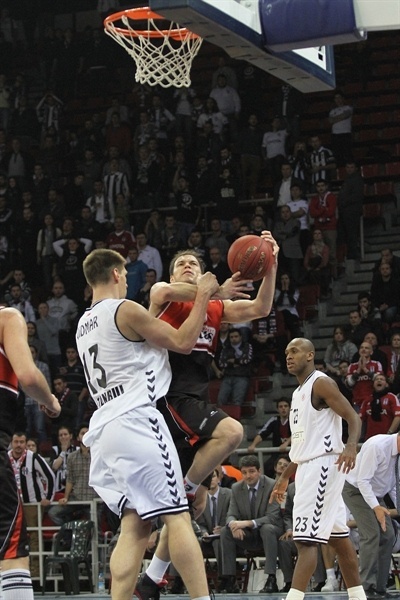 Rytas did not panic, however, as free throws by Nedovic and a close basket by Ivanov gave the guests a 25-36 margin. Patrick Christopher made foul shots and a jumper by Ewing kept Besiktas within 29-36. Christopher and Ewing brought Besiktas even closer, 33-37, but a huge dunk by Ivanov fixed the halftime score at 33-39. Ewing shined with a driving layup right after the break, but Katelynas buried a three-pointer from the right wing and Seibutis added a mid-range jumper in transition for a 35-44 Rytas lead. Vidmar made free throws and Markota soon brought Besiktas within 39-44. 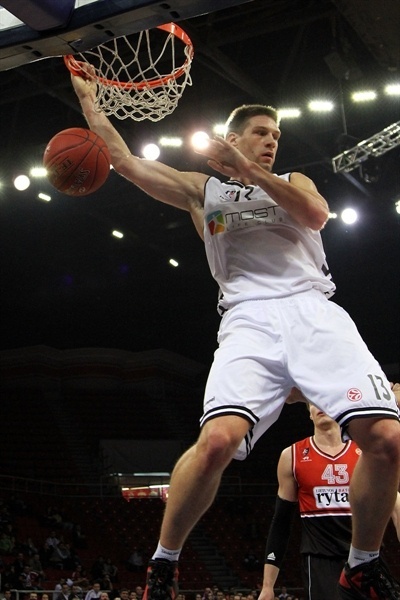 Rytas improved its defense and Nedovic shocked the crowd with a huge jam in traffic. Radosevic soon scored around the basket as Besiktas called timeout at 39-48. Markota tried to change things with a jumper and Jerrells scored in penetration for a 43-48 Besiktas deficit. Radosevic stepped up with a jumper, but Cetin answered from downtown and free throws by Ewing made it 48-50. Blums silenced the crowd with a wild three-pointer, but Ewing quickly answered from downtown to keep Besiktas within 51-53. A free throw by Babrauskas gave Rytas some fresh air, 51-54, at the end of the third quarter. Just as at the end of the third quarter, Babrauskas made 1-of-2 free throws early in the fourth period. Both teams went scoreless for more than two minutes until Jerrells buried a jumper. Christopher soon added his own shot to tie the game at 55-55 with six minutes to go. Babrauskas split free throws, but Christopher nailed a catch-and-shoot jumper to put Besiktas back ahead, 57-56. Radosevic rescued Rytas with a fast break dunk and even after Vidmar shined with a put-back slam, free throws by Seibutis and a backdoor layup by Ivanov gave the guests the lead, 59-62. Christopher scored in penetration, but free throws by Ivanov kept Rytas ahead 61-64 with three minutes to go. Ewing ignited the crowd with a layup-plus-foul to tie the game at 64-64 with two minutes to go. Radosevic split free throws and a put-back basket by Jerrells gave Besiktas a 66-65 edge with over a minute left. Ivanov and Seibutis missed from downtown and Rytas sent Markota to the foul line with 12 seconds to go. He missed both attempts, but Blums missed a driving shot which danced around the rim, but did not fall in at the buzzer.